Glenbard Township High School District 87 assesses fees to all students of the district. School Policy 4:140 defines “school fees” or “fees” as any monetary charges collected by the District from a student or the Parent/Guardian of a student as a prerequisite to the studentís participation in any curricular or extracurricular program of the District. Administrative procedure 4:140 states that the expenses for all items shall be waived to those students who are approved for the waiver. Textbooks and/or electronic devices shall be loaned free of charge to the student approved for waiver. The student will return the textbooks and/or electronic devices upon completion of the course. If textbooks and/or electronic devices are not returned, it is the responsibility of the student and/or parent to pay for these items and fines. Letter from Department of Human Services (DHS) citing benefits approved for the Supplemental Nutrition Assistance Program (SNAP) or Temporary Assistance for Needy Families (TANF) Program. Link cards cannot be accepted as proof of benefits. In addition, Medicaid is not used to determine eligibility for waiver of student fees. 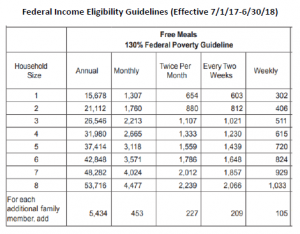 Verification of total income within the Federal Government Income Eligibility Guidelines (see required documents on next page). Children in foster care may receive a waiver of fees regardless of income. * If you are self-employed and do not receive pay stubs and/or W2 forms, you must submit a record of income earned from the business over a recent period of time (e.g. profit/loss statement). You may submit a 1099 tax form in lieu of a W2 form. Applications will be reviewed by District Administration. Notification after decision will be made in the form of a letter to the applicant within thirty (30) calendar days of receipt of the request. If your application is denied, the letter shall state the reason for the denial and shall inform the parents of their right to appeal, including the process and timelines for that action. Parents/Guardians who submit an appeal within thirty (30) calendar days of receipt of denial shall have the right to explain why the waiver should be granted. Appeal shall not be decided by the same person who denied the original application. If circumstances change during the school year, parents may reapply for the waiver. 3) Statement Plan, and will be required to keep the account current. Junior and Senior year – student may not attend prom. Senior year – student may not participate in graduation ceremonies. Driver’s Education Students – students enrolled in the behind-the-wheel class must have paid the course fee in full or be consistently making installment payments for the course before course completion record will be forwarded to the Secretary of State to allow student to obtain a driver’s license. iPad Rental – student will not be able to keep their iPad over summer break. Delinquent accounts and Post-Graduation – unpaid account balances may be transferred to a collection agency.